We’re always telling you how wooden blocks should be in every child’s toy box. 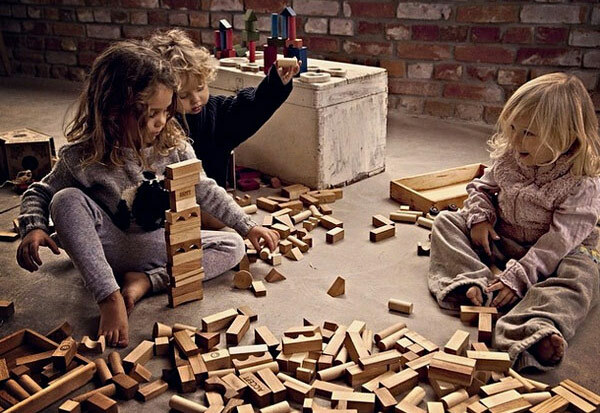 Of course, not all wooden blocks are created equal. Some seem perfect when children are little, but they tell no story, they leave no legacy and they’re easy to discard when your children tire of them. These are not those blocks. 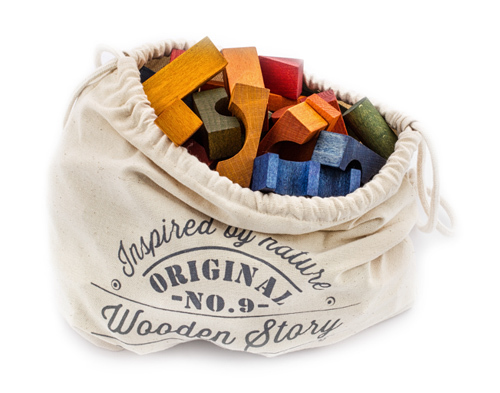 Wooden Story make wooden blocks with a conscience, both literally and figuratively. 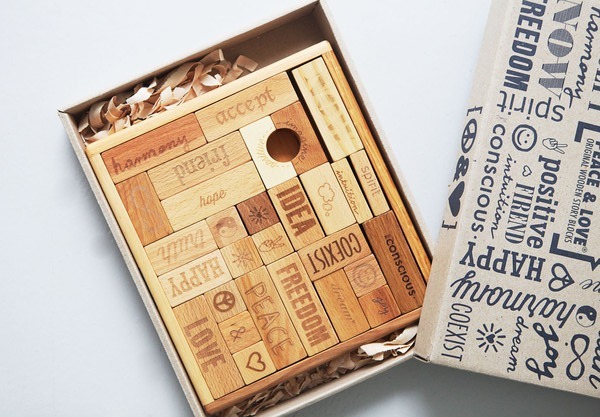 Their aptly named Peace and Love blocks, handmade from eco timbers in Poland, are imprinted with messages – life values, if you like – that I’m sure every parent wants for their child. 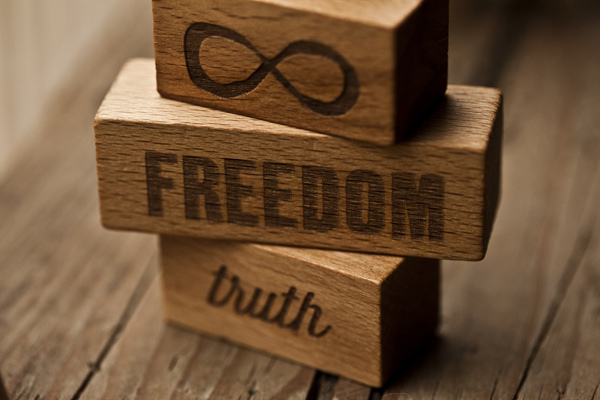 Messages of freedom, of friendship, of truth and acceptance, of love and peace. Lofty ideals, yes, but ideals and values worth striving for and worth instilling in your children. And, if as experts are wont to say, children learn through play, then these beautiful blocks make even more sense. It’s not just the blocks that tell a beautiful story, the tale behind them is rather lovely too. 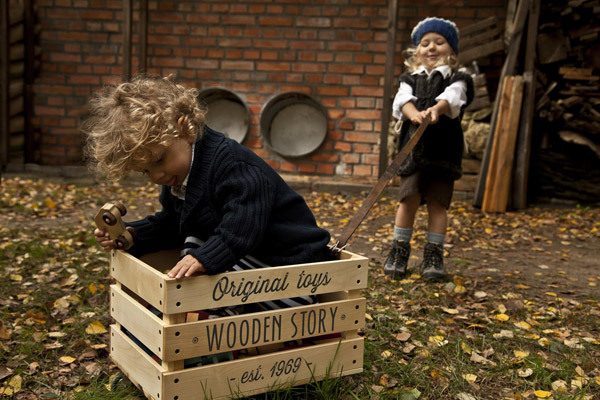 All the Wooden Story toys are crafted in Poland’s Beskidy Mountains, in the very workshop you see in these pictures, and the whole ethos of this toy company is to create playthings for children that are both natural and, in turn, inspired by nature. “We say that the toys came to us from the forest, they smell of wood and you can still hear in them the sound of wind,” the company’s story goes. 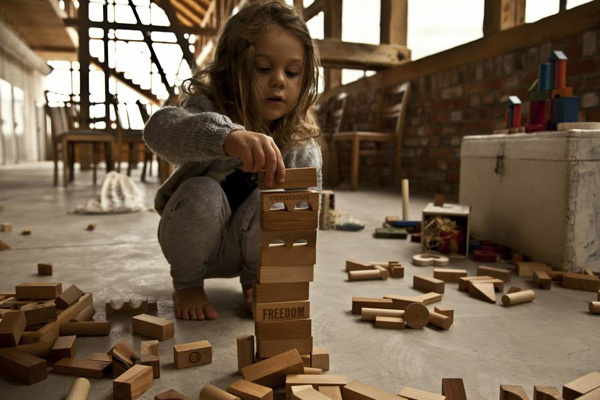 The blocks are carefully crafted from specially selected pieces of FSC certified woods and sanded perfectly smooth before being finished in natural beeswax and botanical oils, so you know they’re safe for little ones to play with. The Peace and Love blocks are the showpiece for sure, but there are some painted blocks in the range too and they are finished in natural eco-certified paints for parental peace of mind. Other blocks are sanded but left unfinished for parents who prefer toys to have no coatings at all. Only just arrived in Australia, larger sets of Wooden Story blocks come with a wooden tray for storing and are presented beautifully in a paperboard box so it goes without saying that they are the ideal special occasion or keepsake gift. Smaller sets come in a heavy-duty cotton sack. I must tell you too, that if these blocks are kept and treasured and end up entertaining your children’s children and perhaps even your children’s children’s children, then Wooden Story will consider their job well done. Now for where to find these lovelies. 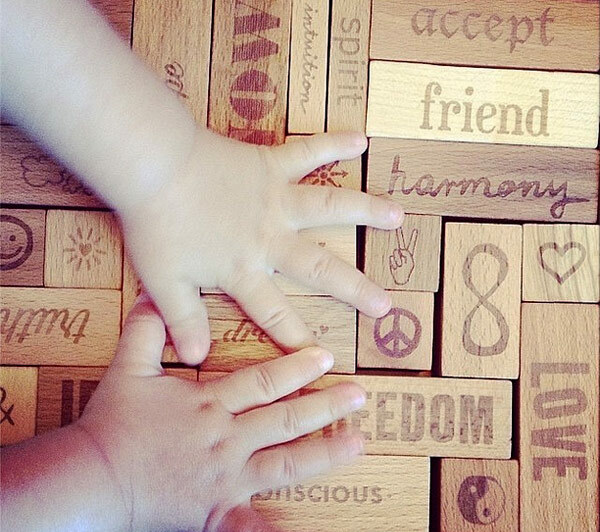 The large 108-piece set of Wooden Story Peace and Love blocks is available from Entropy Toys for $259. A smaller 28-piece Peace and Love set is available from Down That Little Lane for $184, while you can find sacks of natural or coloured Wooden Story blocks over at Shop Of Toys, priced from $99.95. For more information about Wooden Story, or to see the other toy marvels made by this Polish company, stop in at Australian distributor Axis Toys.